We used all fast flashing to modify this car. The LED colors show off much better in person, our camera can't capture the colors of such bright LEDs! Need different colors? Not a problem! contact us or mention your changes in the comments box at checkout! In this kit you get: Our 4 tone Siren with pre-attached battery snap/switch Plus! Headlight 4 3mm Cool white Fast Flash 14"
Front Grill 2 3mm Red-Blue Fast Flash 14"
Rearview Mirror 1 1.8mm Red Fast Flash 14"
Rearview Mirror 1 1.8mm Blue Fast Flash 14"
Tail Light 4 3mm Red Fast Flash 8"
Brake Light 1 3mm Red Solid 8"
Back Ledge 2 3mm Yellow Fast Flash 8"
Back Ledge 2 3mm Red-Blue Fast Flash 8"
License Plate 2 3mm Cool White Fast Flash 8"
A total of 19 LEDs plus a siren and battery snap switch. All will run on the single 9 volt battery. The 9 volt fits into the trunk on 1:18 Motormax Crown Victoria cars. We pre-attach a siren to our a Battery strap/switch for easy installation. Install is not too hard, but it will be a time consuming project. 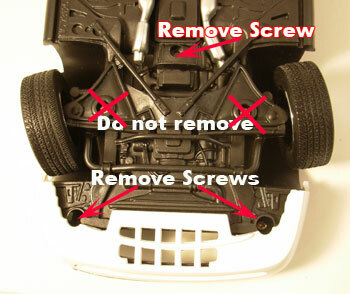 Unscrew the screws on the underside of the car and pull the chasy out of the body. Now you have your hollow police car ready to work on. remove the lenses from the inside. You can use a soldering iron and heat up the plastic stub holding the lens in place and then gently slip it out of the hole. Our lights come wired with resistors. Note: They are not pre-connected to the battery strap, we find it easier to install them when they are not part of a net of lights. 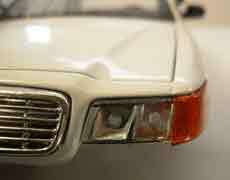 When you get your lights glued in place with silicone or superglue, use small strips of duct tape inside the body of the car to keep the lights solidly in place. Now bring all the black wires back to the black on battery strap and hook them up. For extra security use solder. Same process with all the red wires and the red on the battery strap. We also use small strips of duct tape to tape the wires out of the way of re-assembly. And also to make sure the wires cannot be seen. The siren we have pre-connected to the battery strap. The siren has its own momentary tap switch. And there is a separate switch for the lights. connect your fresh 9 volt battery to the battery snap and put it in the trunk. You may need to remove the spare tire to fit the battery depending on the car. "what else is needed beside the car?" We use a 7/64th drill bit when we want just the tip of the LED to poke out the hole, like behind the headlight and tail light lens. When we want the whole LED to show like on the back ledge, we use a 1/8th drill bit. Epoxy to hold the 2 switches in place poking out underneath the car. We have already in this kit a switch for the siren and a switch for the lights. So you can run either lights or siren or both together. We do have a siren install video here: Siren Install Video view it to see how the siren is normally installed.